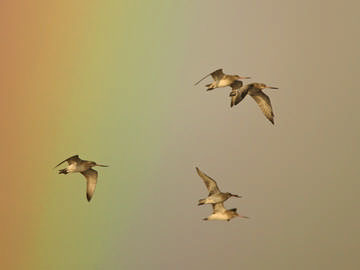 Bar-tailed Godwits are record-breaking long-distance migrants, with satellite-tracked birds from the Alaskan breeding race flying non-stop for eight days, more than 11,000 km across the Pacific to winter in New Zealand. Those that we see in Cheshire and Wirral have not undertaken such prodigious journeys, but nevertheless have come here for the winter from breeding areas far to the northeast. A bird ringed at West Kirby in winter 1965/ 66 was shot on 20 May 1967 near Arkhangel in Russia (65°50´N 44°17´E), 2922 km away and still probably on its way to its breeding grounds on the Taimyr peninsula of Siberia. The Atlas map shows that the main areas for them in the county are the north Wirral coast and the outer parts of the Dee estuary. Mockbeggar Wharf off Leasowe (SJ29R) is usually the most important feeding area for Bar-tailed Godwit, but the largest flocks recorded in a tetrad were 3,000 each on Hoylake Shore (SJ28E) and East Hoyle Bank (SJ29A), just offshore from there, in 2004/ 05. Away from the north Wirral, Bar-tailed Godwits are scarce, with a maximum during this Atlas of seven birds in the south Dee estuary, 21 in the Mersey estuary (SJ47I) and ten at Fiddler’s Ferry (SJ58M). They are seldom found in winter away from tidal areas, the last records listed in the annual bird reports being in November 1996 at Neumann’s Flash (SJ67T) and Tatton Park (SJ78K). The Dee estuary is listed in the national WeBS reports as holding the eighth highest total of Bar-tailed Godwits, with a five-year peak mean of almost 2,800 birds (Musgrove et al 2007), but this is a meaningless figure because it averages one year’s low-tide feeding flocks (12,163 birds in 2001/ 02) with four years of roost counts ranging from 1,209 (2003/ 04) to as low as 127 birds in 2002/ 03. For feeding birds, the Dee and the north Wirral shore may well be the most important site in Britain, or perhaps in second place behind the Wash. The explanation for this is just the same as for Knot. Until 1979/ 80, Bar-tailed Godwits used to spend all winter on the Dee, with a maximum count of 11,149 in February 1977, but in 1980/ 81 the birds feeding on the Dee suddenly shifted to roost on the Alt estuary to avoid the frequent disturbance from dog-walkers, horse-riders and anglers (Mitchell et al 1988). Even with the area patrolled by the Dee Estuary Voluntary Wardens, the godwits have never come back to roost on high tides on the Dee, although clearly the feeding is good and foraging birds are around in near-record numbers. Female Bar-tailed Godwits are larger, with longer legs and bills, and feed in deeper water: they monopolise the better quality foraging areas along the tide-edge, leaving males to feed more on the exposed intertidal mud flats. The species’ favourite prey is lugworms arenicola, which tend to be found in the sandier areas, not used as much by other waders. These burrow too deep even for the godwits’ long bills to reach, so they wait for them to come to the surface then run to probe in the newly formed worm cast. They also take large ragworms nereis, with some smaller worms and macoma molluscs.